My wife and I just made it back from Nashville on Sunday before the snow storm swept down upon Jersey. Worn out from the weekend's activities in Nashville where more than 30,000 some odd turkey hunters and their families gathered for the NWTF convention, we used the bad weather as an excuse to nap the rest of the day. Despite being beat, I have to confess, I wasn't feeling as exhausted as some of the federation's employees were surely feeling. I worked the event while with the organization for almost seven years and I have to confess, it is a heck of a lot more fun on this side of the experience. It still didn't mean I had much down time as we worked to meet with countless turkey hunting personalities and manufacturers to produce a whole line up of ideas that will help you become a better turkey hunter this spring. If you're looking to see who won the latest contest (calling, call making, taxidermy or otherwise), check out the NWTF convention news page. I'll also have more details on my experience at the temporary turkey hunting capitol of the world in the coming posts. Stay tuned. Just moments ago, Shane Hendershot of Zanesvile, Ohio, claimed the Wild Turkey Bourbon/NWTF Grand National Senior Division Calling Championships. It is Hendershot's first Grand National victory. He unseated defending champ, Matt Van Cise of Pennsylvania, who was the first runner up. Rounding out the top five were Georgia's Kerry Terrell in 3rd place, Billy Yargus of Missouri in 4th and James Harrison, also of Missouri, who finished in 5th. 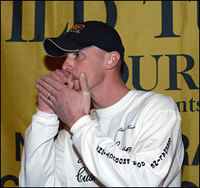 In the Owl Hooting Competition, former champion Dale Palmer of Illinois claimed another crown, while in the Gobbling contest, Scott Wilhelm of Wisconsin took top honors. 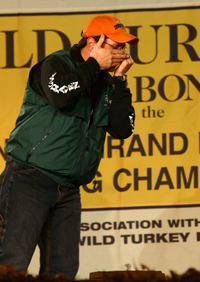 Sixteen-year-old Lance Hanger of Churchville, Va. won the NWTF Grand National Intermediate Calling Championship. The Junior Division winner was once again, Dakota Clouser, 15, of Fort Smith, Ark., who set a new record by being the only youth to claim the junior title four times. Check back throughout the week to see a video of the trophy ceremony as well as more news on this years NWTF convention. Official Strut Zone Position Statement: Guns - all makes, models, calibers and gauges - are a lot of fun to shoot. Enjoy them responsibly. In case your head is numb from all the cold and you've lost track of the days, here's some information to offer you hope: The first turkey season of spring, Hawaii's, opens in just 18 days! On the mainland, in Florida, the first seasons open March 3. That's just 20 days away. Now's a great time to dig into your gear closet and start going through old calls, camo and other items to figure out what's going to need replacing or quite simply, what you're going to need to buy to make this season better than last. If you haven't already begun to plan your hunts at home or across the U.S., check out the NWTF's Web site for a look at this year's Spring Hunt Guide. 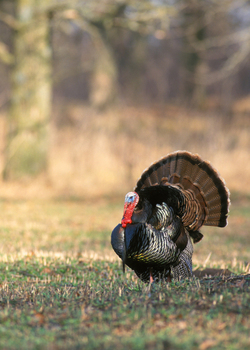 It offers season dates and other important info about every turkey season in the country--all in one spot. While I haven't been able to get to the Strut Zone personally, I've been busy behind the scenes at Outdoor Life working on some awesome turkey coverage in the magazine as well as checking out a host of new products—some of which are awesome, some that will leave you scratching your head. The picture accompanying this post is of a photo shoot that officially kicked off OL's spring coverage. 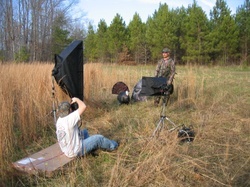 It was shot in a Virginia clearing in mid-December, long before most folks are thinking of spring turkeys. That's how far ahead of things we have to be around here. So with that, stay tuned in the coming days and weeks as I bring you a host of gear, tips, hopefully some videos and ample observations into the world of turkey hunting and beyond. I'd also like to give a big welcome to Winchester Ammunition, who is coming aboard to sponsor the Strut Zone in February and March. While I hate sounding like I'm making fun of an incredible tragedy, the circumstances surrounding a Brooklyn, N.Y., man's death this week in an upstate hunting camp are just plain bizarre. Although the article that the story appeared in called it a "hunting" accident, it was a hunting accident only in as much as 58-year-old Jose Cruz was in a hunting camp when it occurred. You see he wasn't on a stand or roaming the woods in search of squirrels or some other game. He was sitting in an outhouse taking care of business when a friend of his, who was sighting in a rifle and aiming at a target 121 feet away, somehow shot him through the wall. I mean come on. Not sure how an outhouse and a target are set up where the one is in the line of fire of the other, but lets be careful out there folks. Always make sure when shooting that you maintain a safe and clear field of fire and know what lies beyond your target. There's just no excuse for a situation like this. Although nobody should have to be concerned about being mistakenly shot while hunting, they darn sure shouldn't have to worry about it while sitting on the toilet. That's the last place I would have figured on needing to wear Blaze orange! Nevada turkey hunters who hope to pursue birds this fall have until 5 p.m. Friday, Sept. 1, to get their applications into the Department of Wildlife. Hunters may apply on the Internet at www.ndow.org. The Nevada Appeal reports there are 45 resident tags for the Mason Valley Wildlife Management Area in Lyon County and 20 tags for Moapa Valley in Clark County. There are open quotas for Churchill County and Lyon County, excluding the Mason Valley Wildlife Management Area. Nonresidents are pretty much out of luck, but then, why travel to Nevada to fall turkey hunt anyway when odds are there are probably much better opportunities to pursue autumn birds in your own state. Nevada turkey populations are still fairly small by most states' standards with birds mostly found on private lands and tags (when available) are pretty difficult to draw. My phone rang shortly after getting into work this morning and the news I received hit me like a slap in the face. I guess even now I'm still a little in shock. 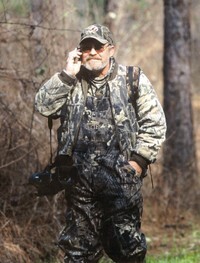 John Adkins, 55, passed away early this morning, marking a huge loss for his family and friends and a big loss to the turkey hunting community as well. News of his passing came just days after I attended a funeral for a woman my wife and I know who also passed much too young. Most of you have probably never heard of John, but if you are a fan of outdoor television, most notably, any of the turkey hunting or land management shows produced by the NWTF, then you are familiar with his work. You see, John has been involved with those programs--Turkey Call, Turkey Country and Get in the Game--since the Federation first decided to get into the TV game. I met John at a meeting just before they began filming for the first season of Turkey Call back in 1998. I had just started working at the Federation as managing editor of Turkey Call magazine. I got to know him over the years as we worked together on the programs and in producing the live shows during the NWTF's national convention each year. He was a funny guy who would talk your ear off, but he'd also give you the shirt of his back and had a heart as big as gold. He was often seen with a cell phone to his ear, which makes the picture of him appropriate. John could also take a joke and give one back. And he had a wonderful family. His youngest daughter Emmi, who I learned had just started college, used to baby sit my daughter. My thoughts are with her and the rest of her family right now. The NWTF released a statement today concerning his untimely passing, which you can read by clicking on the continued link below. Meanwhile I'll keep his family and friends in my prayers and I ask that you do the same. John, you'll be missed buddy. Happy trails. A Cleveland, Ohio, television reporter is on the job and delivering the type of onscreen journalistic fortitude that characterizes body-armor clad anchormen in battle zones and wind blown weathermen in hurricanes. But the focus of this street savvy newsman is a wild turkey (it appears to be a jake) wandering a Cleveland suburb. The brazen bird was daring traffic to hit it and causing quite a stir among gawkers unaccustomed to spying such large birds in their tranquil neighborhoods. There was nothing in the television station's brief online report that indicated that the reporter came under any danger!